Joachim Bohnsack was the son of Johann J.H. Bohnsack and a brother of my g-g-grandfather, Carl Herman Bohnsack. Joachim is buried in Greenwood Cemetery in Galena Illinois. I found his headstone when I was doing my walking tour of Greenwood Cemetery. I knew he was buried in Greenwood; I just didn’t know where. I also think it’s odd that he and his first wife, Marie (Peters), are buried in different cemeteries. Buried next to him is a Fredericka Bohnsack. His second wife’s name was Recha (Palmer). Until I stumbled upon his headstone, I never heard of a Fredericka Bohnsack. I assume this is his second wife, with Recha being a nickname of Fredericka. Joachim did not have a daughter or sister by this name. It’s a bit of an odd juxtaposition – he has this large headstone, and Fredericka has a much smaller marker. The following obituary was published in the Freeport Journal-Standard on Friday, 28 Feb 1936. Galena, III., Feb. 28.—Funeral services for Joachim Bohnsack, 70, who died at 3:30 o’clock Thursday morning at his home on Gear street after an illness of several months, will be held Sunday afternoon at 1:30 o’clock from the family home and at 2 o’clock from St. Matthew’s Lutheran church. The Rev. T. F. J. Pagles of St. Matthew’s will officiate, interment will be made in the family lot in Greenwood cemetery. Mr. Bohnsack was born in Hindenburg, Germany, May 6, 1856. He came to Thompson township in this county 47 years ago. Twelve years ago he retired as a farmer and moved to Galena, where he has since made his home. He was a loyal member of St, Matthew’s Lutheran church here throughout his lifetime. 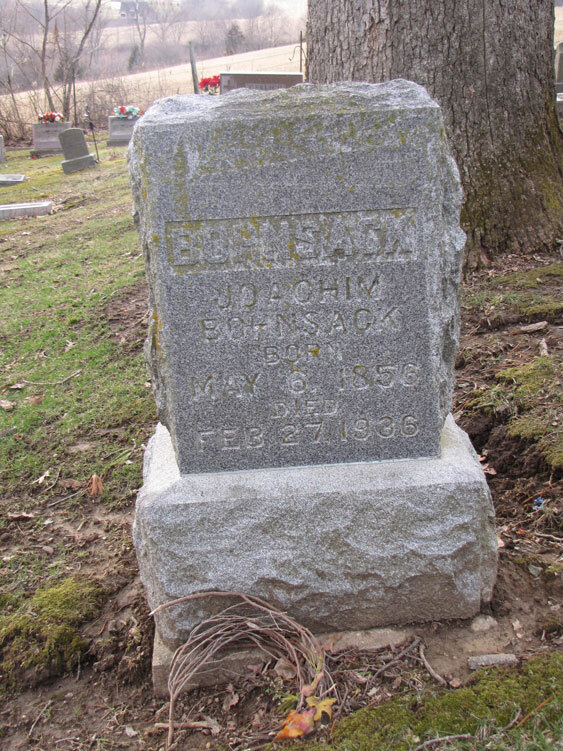 Mr. Bohnsack’s first wife died seventeen years ago. Eight years ago he married Mrs. Recha Palmer, who survives, as do three sons by his first marriage, Benjamin of Galena, Herman of Thompson township, Ernest of Guilford; a brother, Herman Bohnsack of Schapvllle, two sisters, Mrs. Fred Meinan [sic] of Apple River and Mrs. William Studier of Galena. Three children died in infancy; a daughter, Mrs. Mina Wasman died a number of years ago, and another daughter, Mrs. Ira Tressillian of Galena died July 11, 1935.